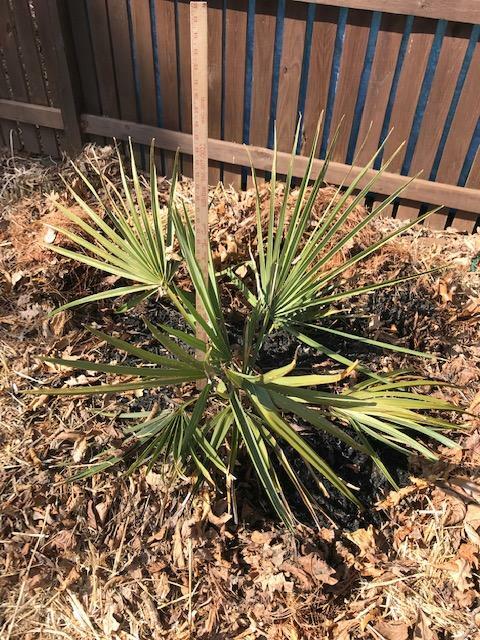 A few of my palms did have some damage, one Butia had a lot of browning (it was covered with a bucket), another Butia had tip browning (it was covered in a large pot), and my Mediterranean Fan Palm had a lot of browning on random places (covered with a wooden structure and a tarp). 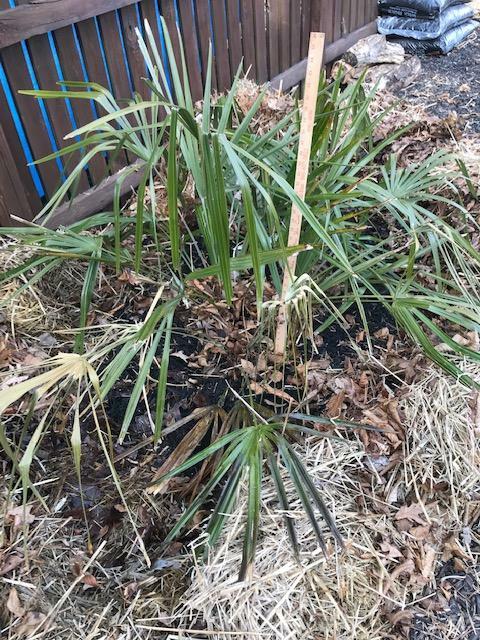 My Needle Palm and Windmill Palm appear to be fine. The windmill had a tarp over it and many layers under and the needle had no protection. 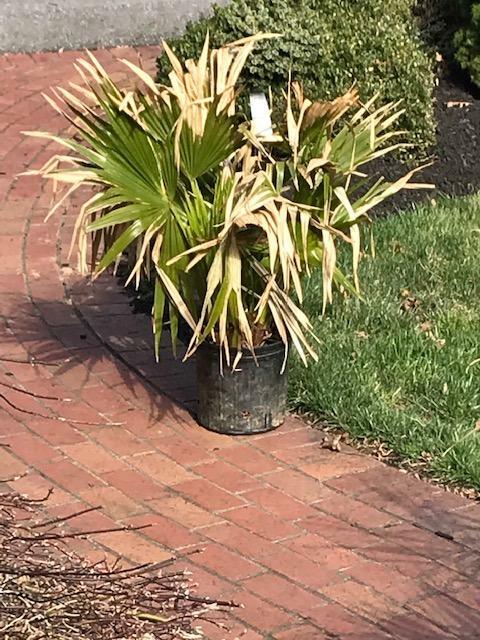 No heat was applied to any of these palms. We went down to 3 degrees F one night. First pic is Sabal Minor - 8 or so inches of oak leaf and straw mulch. Also a 4 foot high wind break with frost cloth (That fence is north of the plant also providing wind protection.) Basically no damage and a spear developed (to the right of the yardstick) First winter in the ground. The last two are Chinese fan palms. tried to keep them in the garage (not heated but usually in the 40s) when outside temp got below 20ish, otherwise spent day in the Sun (southern exposure) There are some completely green fans most many have partially turned yellow. I added grow lights in the garage in January. This did not turn out so well, though do have some new spears Planning to trim off dead materiel and leave all the green. So I ordered 100 Washingtonia robusta seeds from Amazon around a month ago (It costs like $3). I got the seeds, but they weren't what I was expecting! They came from China and are Trachy seeds! Oh well, lesson learned, haha. 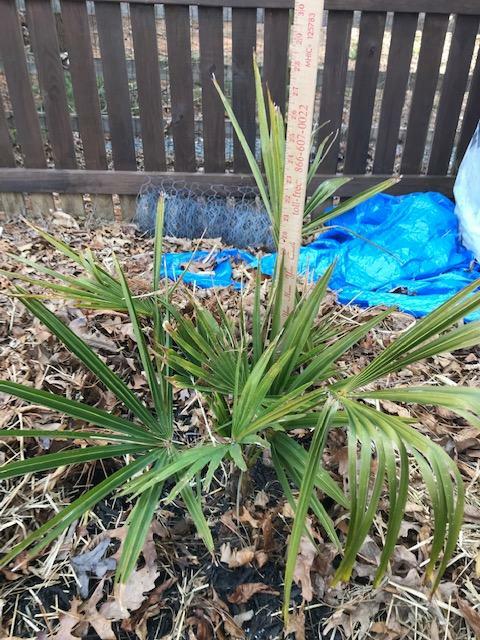 I had this little date palm seedling in my garage only getting sun when it was open and was only watered literally four times this Winter. It was tilted and everything and I just straightened it out and put it into the sun. It has a new spear and everything, it looks a lot better than my christmas palms which were in the same situation, that's for sure. 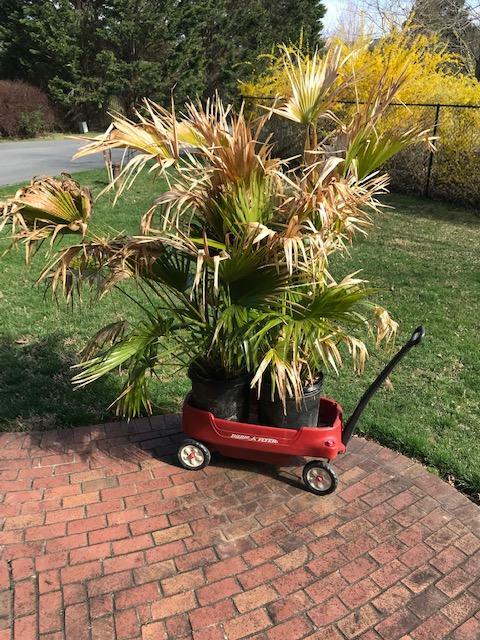 Spring cleaning for me is finding plant stuff in my garage, including a ton of old seed that I lost (hopefully that Washingtonia filifera are still good)!